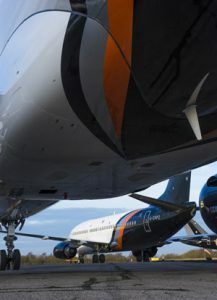 Titan Airways, the UK based bespoke and VIP charter airline, returns to the European Regions Airline Association’s Annual General Assembly this week (9th-11th October) as it marks its 30th anniversary. With the commencement of the IATA winter timetable, it restarts a series of winter ski operations to France, Italy and Switzerland, working with six ski companies – Ski Esprit, Ski Total, Inghams, Crystal Ski Holidays, Neilson and Sky World. It will also be resuming winter sun flights to Banjul, Gambia, for the third successive year, departing from London Gatwick. One of its Boeing 757s, in a split business/economy layout, concludes a month-long world tour later this month for a France based luxury tour operator, complete with onboard chef. Over the summer Titan continued to support British Airways at Gatwick (including support flying on London Gatwick-Edinburgh) as well as easyJet, from Gatwick, Berlin and Munich, Germany and Jet2.com – from Stansted and Leeds. The airline is in the process of reconfiguring a second Boeing 737-400 from passenger layout to dedicated freighter. It enters service in early 2019 – Titan’s response to a resurgence of interest in freight capacity – into and out of the UK. Its rescue flying bolstered turnover by 7%, with Titan becoming a £100 million revenue airline in its 30th year – for the first time in its history.